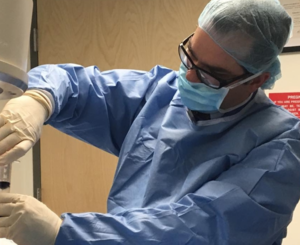 But, patients who suffer from pain now have access to cutting edge solutions at Orthopaedic Specialists of Connecticut (OSC) — without resorting to addictive painkillers. Patients suffering from musculoskeletal, neurological and cancer related pain can be treated through various procedures, including blocking affected nerves. A study published in The New England Journal of Medicine shows a direct correlation between chronic drug use in patients with doctors who prescribe them more often. “There are pain physicians who do not possess the skill set to treat their patients by any other means than managing their medications,” said OSC pain management specialist Dr. Antonio Paz. Interventional Pain Management is regarded as one of the most significant tools against the opioid crisis because it treats pain without the need for long-term medication. “Medications are not my first line of therapy,” said Dr. Paz. “An interventional pain physician can offer much more to their patients because we are able to treat them through a variety of procedures that are minimally invasive and long-lasting.” The field of interventional pain management is relatively new, and there is still not enough awareness about its novel techniques and potential for treating pain. Diagnosing chronic pain is subjective.“Identifying pain generators in a chronic pain patient can be a complicated, multi-step process,” said Dr. Paz. A pain specialist looks at the problem differently. They understand the foundation and allow for the most targeted treatment and best results, “ he said. Studies show that doctors take women’s pain less seriously than men’s because they have different ways of enduring and expressing it. Seniors tend to have a higher pain threshold than their younger counterparts. There’s no formula for quantifying pain. Physicians use a visual analog scale to determine where an individual lies on the spectrum of pain. But, there are racial, gender, and personal factors that can influence someone’s response. On the pain scale, one individual’s ten could be another one’s seven. “In the end it doesn’t matter because I’m just focusing on how much your pain improves with treatment,” Dr. Paz explained. And not only that, but he can ensure the treatment is effective before actually embarking on it. By blocking the affected nerves, the patient can confirm whether or not the pain has subsided — in a matter of minutes — and get subsequent treatment to provide long-term relief. “Behind most injections there are immediate results, which allow me to gauge success and plan for further treatments,” said Dr. Paz. At OSC patients can be treated with several different procedures, on a case-by-case basis — all of them minimally invasive and performed with X-ray guidance and/or ultrasound. Injections: either anti-inflammatory drugs (steroid) or nerve blocks (local anesthetic- numbing medicine). Radiofrequency Ablation/Rhizotomies: destruction of a peripheral nerve — only the sensory branches, no nerves associated with motor skills. Neuromodulation: electrical stimulation in the spinal cord to treat chronic neuropathic pain. It is done by placing two electrical leads through the skin into the spine connected to a generator implanted in the subcutaneous tissue, much like a pacemaker. Regenerative medicine: includes injecting damaged tissue with the patient’s own stem cells or platelet rich plasma, to allow the new cells to adapt to their environment and repairing it while they do so. Although regenerative medicine is still considered investigational in the medical community at large, it is a rapidly expanding field, which has shown incredible potential. Dr. Paz lives with his family in Ridgefield. Orthopaedic Specialists of Connecticut has been treating patients from the greater Danbury area for almost 40 years. Their physicians completed fellowships in orthopedics, sports medicine, joint replacement and interventional pain management. They trained at the top universities and hospitals in the country, including Harvard, Yale, The Hospital for Special Surgery and The Hospital for Joint Diseases. According to recent data, their surgical outcomes are well above national standards and unequaled in the area.